Anya Greenberg - Greenberg & Strelitz, P.A. 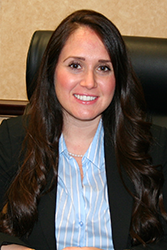 Anya Greenberg is an Associate at Greenberg & Strelitz, P.A. Mrs. Greenberg is fluent in English, Hebrew, Russian, and Spanish. She obtained her Paralegal Certificate from the University of Miami in 2010, and then continued her legal education at Nova Southeastern University, where she graduated with a Juris Doctor degree. Mrs. Greenberg’s experience includes being a Certified Legal Intern with the Broward County, Florida State Attorney’s Office, where she tried both jury and non-jury trials. Mrs. Greenberg is a huge asset to Greenberg & Strelitz, P.A. and its clients.